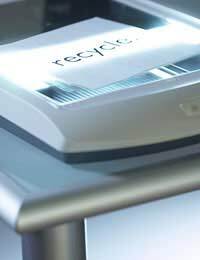 If you want your business to go green, recycling is one of the best ways to get started. You can begin just by making use of existing facilities provided by your local council, and you can go on to lobby for more or even provide your own. Paper recycling, plastic recycling, even computer recycling - there are more options out there than you might think and a lot of ingenious ways of going about it. Taking a lead as a recycler within your local community can boost your reputation and help to put your environmentally friendly business on the map. Recycling waste paper is easy to do. If you get it into bundles, you can send it direct to the recycler, so this may ease the strain on council services if your business generates a lot of it. Alternatively, you can recycle directly through actions like supplying old computer paper to schools for kids to draw on. Cardboard, which can be processed similarly, is often useful to artists, and cardboard boxes can be handy for people moving house. Keep talking to your local customers to find out where your waste materials can be useful. If you're serious about paper recycling, you should also take a look at the products your company is using. Plastic carrier bags can often be replaced by sturdy bags made from recycled paper. Styrofoam drinks cups can be replaced by recycled cardboard ones, and there is attractive recycled stationary now on the market. Take a lead and let your customers see your commitment to change. Unfortunately, not all plastics can be recycled with currently available technology, but most of those generated as business waste can. A carrier bag recycling facility will make you popular with customers, some of whom will visit your business premises especially to use it. However, you'll need to amass large amounts of plastic before recyclers will be prepared to take it, as the process can't deal with small amounts. For this reason it's a good idea to work together with other local businesses to recover and collect plastic waste. You can also avoid wasting plastic through several means. Encourage customers to bring their own bags, perhaps by selling long-lasting bags made from environmentally friendly materials like jute, and encourage them to re-use containers by offering cut-price refills of non-food items. Businesses in the refreshment sector frequently accumulate large amounts of glass. Rather than simply throwing this away you can send it to be recycled. Unfortunately, having a glass recycling deposit point close to your premises can present a hazard to customers, as broken glass will often accumulate around it, so you can do your bit by going out with a broom and sweeping up the fragments, keeping the area clean and safe and thus making members of the public happier about using the facility. One of the most environmentally toxic substances discarded on a large scale by businesses is computer waste. When they are simply thrown out, old computers go into landfill where they take decades to decay and release poisonous substances into the earth as they do so. How can you avoid this happening? There are several reasons why businesses get rid of computers. Often, it's simply because they need to upgrade, and there is nothing wrong with the old machines. In this case, don't throw them out - find somewhere to donate them to. Freecycle is a system that makes it easy to donate old computers and office furniture to people in your city. If your computers are so old that no-one wants them, you may be able to send them to third world countries where they will still be useful. Some charity shops will take computers, though this can be difficult for them, as they have to get electronic goods checked for safety before they can sell them. Charities like Shelter and The Salvation Army will, however, be happy to take old furniture off your hands. If you're getting rid of a computer because it's broken, bear in mind that some of its internal components may still be okay. Computer shops specialising in parts and repairs may be willing to pay you a small amount for it, or you can test each part yourself and sell the working ones individually via online auction sites. Try advertising the bits you have left over as free material for crafts hobbyists. With a bit of ingenuity, there's no end to what you can recycle, and by doing so your business can make a real contribution to saving the planet.